In his last moments, with calculated efficiency, he bolted the bedroom door so no one could interrupt the execution of his final act. Charles Craig ended his life with the same cool determination and secretiveness that characterized his public service as a soldier, a cavalryman and an able practitioner of the dirty business of intelligence. Not all of the Revolution’s wounds were physical. War and social upheaval could wreak havoc on the reputations and psyches of many caught up in its chaos. Even the most capable and honorable might be numbered in its human toll. Charles Craig’s life began auspiciously enough. Born to a family prominent in Northampton County, Pennsylvania, between 1744 and 1750, he was endowed with economic and social advantage which, combined with his own natural abilities, heralded a rise to prominence. He was a modest young man, but like the rest of his family, active and ambitious. His family’s early history and ties to Pennsylvania’s influential Allen family influenced Charles Craig’s actions. Around 1728, his grandfather, Thomas (I), was one of the founders of what was called the Craig or Irish Settlement, based around the Presbyterian congregation near Weaversville in Northampton’s Allen Township, northeast of present-day Allentown, then the frontier. The Craigs were related to William Allen (II) (1704-1780), the wealthy chief justice of the Pennsylvania Supreme Court, from whom some of the clan purchased their Northampton lands. The two families maintained cordial relationships. The Craigs led their community through involvement in the law, an interest they shared with the Allen family, and through military service. Prior to the Revolution, Charles’ father, William, and brother, Thomas, were active militia officers. William, named Northampton’s first sheriff in 1752, became a target of controversy through the family’s efforts to control the new county’s legal structure, and was censured by Pennsylvania’s governing body. When the French and Indian War broke out, William Craig was commissioned a captain of militia. Alarmed by skirmishes and killings in the area, he sought to increase the size of his company beyond its authorized quota. William’s father and father-in-law attempted to force the issue by pressuring Benjamin Franklin, then in charge of organizing Northampton’s defense for the provincial government. They demanded “an additional 30 men to Craig’s company, or threatened they would immediately one and all leave their Country to the enemy.” Franklin refused the increase. In October, 1763, disaster struck the Craigs’ rural community. A group of Indians became incensed by recent murders of their people and ill treatment they suffered in John Stenton’s tavern at Weaversville. They rampaged through the neighborhood, killing about twenty-three people including many defenseless children, wounding and maiming several others. No doubt this catastrophe, so close to home, shaped Charles’ thinking about the importance of military service. About this time, a land dispute flared in Pennsylvania’s Wyoming Valley, between the Province and settlers from Connecticut, who claimed the land under the auspices of their colony’s Susquehanna Company. Low-level hostilities escalated to the point that, by 1770, Pennsylvania sent a posse, under authority of Northampton County Sheriff Peter Kachlein and Capt. Amos Ogden, to take possession of the area, arrest the ringleaders and expel the settlers back to Connecticut. Charles Craig’s brother, Thomas (II), then about thirty years old, was appointed an officer under Ogden. On the night of September 23, Thomas was in the van of an attack on tiny Fort Durkee. Stepping up to the fort’s sentinel, Craig spoke to him as though he was a friend. Having put the man off his guard, Craig knocked him down and led the storming party into the fort, at the same time exerting himself to reduce bloodshed, for which he received considerable acclaim. Thomas served as a strong role model for his brother, Charles. They remained close friends until the younger man’s death at his brother’s home. Initially, the Allen family supported the cause of American freedom warmly. William Allen (II), through his personal accumulation of wealth and power, and through familial connections, was a member of America’s aristocracy in the years leading up to the Revolution. As a member of the Pennsylvania Assembly, William led the proprietary faction, which supported the Penn family and battled Benjamin Franklin’s Quaker party for control of the province. He and his sons actively espoused Americans’ economic independence and right to self governance within the framework of the United Kingdom. As an Assemblyman and Chief Justice of Pennsylvania, William strongly supported American rights, resisting the Stamp Act and other Parliamentary actions contrary to American interests. In 1775, when the new military establishment was being created, the Craig brothers were recommended to Northampton authorities for preference among its officers. John Allen, eldest son of William and a member of Philadelphia’s Committee of Observation and Inspection, wrote to William Thompson, colonel of the recently formed Pennsylvania Rifle Battalion, urging positions for Thomas and Charles Craig in the battalion’s Northampton company. When the county’s Committee of Correspondence directed the newly-formed rifle company to vote for its officers, they selected Abraham Miller as captain, Charles Craig, first lieutenant, Thomas Craig, second lieutenant and Samuel Craig, likely a cousin, third lieutenant. Pressure was brought to bear on Miller. On June 30, Thomas delivered a letter to Northampton’s Committee of Correspondence from Pennsylvania’s congressional delegation recommending expanding Thomas’s recruitment efforts, and at the same time recommending that he lead the county’s rifle company. This ploy was supported by a second letter from two locally prominent men, James Allen and James Biddle, Esqrs. The committee diplomatically resolved that, if Captain Miller were to resign, they would appoint Thomas Craig to the position. Charles’ election as first lieutenant caused him some embarrassment since it put him in line to succeed to the captaincy—the brothers’ intent had been to get that position for Thomas. In September, anticipating Miller’s resignation, Charles wrote to Colonel Thompson requesting permission to resign his commission as first lieutenant in favor of his older brother. The same day, Thomas wrote asking to resign hispost as regimental quartermaster in favor of Charles. Charles Craig and Thompson’s Pennsylvania Rifle Battalion served through the end of the Boston Campaign. As one of only a handful of Continental officers at the time, Craig and the other rifle company captains were well known to the commander in chief. His friend, Charles Biddle wrote that “General Washington, and every person who knew him, was fond of him.” For his own part, Biddle felt “I had never known a more amiable person.” A known quantity and reliable person, Washington gradually placed trust in Craig as time went on, later using him as an aide de camp, and an intelligence officer between the lines at Philadelphia. On January 3, 1777, as the Americans marched toward Princeton, New Jersey, Captain Craig was serving as a liaison between headquarters and the German Regiment, one of the units leading the advance. As the fighting intensified in Haussegger’s rear, around the Clark farms south of Princeton, Craig informed Haussegger that Washington wanted him to cut off the British retreat toward the town. Riding ahead of his men, Haussegger stumbled into a British defensive position and was captured. Questions were subsequently raised about Haussegger’s loyalty—many believed he had intentionally surrendered to the enemy—and he was eventually convicted of treason by Pennsylvania’s Supreme Executive Council. While Craig’s role likely increased his visibility with the army’s leadership, his proximity to a man of dubious loyalty may have done his own reputation more harm than good, especially in light of later events. The American Army underwent yet another reorganization at the start of the new year. With the establishment of the Col. Stephen Moylan’s Regiment of Light Dragoons, Charles Craig was appointed captain of the regiment’s first troop. It soon became clear that there were those who disliked the captain or suspected his loyalty. In May, Congress received a “report that Capt. Craig has enlisted into his troop some deserters and prisoners of the enemy,” an accusation which investigation proved untrue. Despite this, his new commander, Stephen Moylan, was so impressed with Craig’s performance that, by July, he recommended the captain to Washington for promotion to lieutenant colonel. Moylan thought Craig “the Oldest Captain in the Service,” noting that he was “brave, modest, the later part of his character is, I verily believe, the reason he is Still a Captain.” The promotion, however, did not materialize, possibly because of a mutiny among Craig’s troops at a crucial moment. On July 8, British troops started boarding the ships gathered in New York harbor. The Americans kept a close eye on this activity, but it wasn’t till July 20 that the fleet dropped down toward Sandy Hook, in preparation for heading out to sea. Washington ordered several units, including Moylan’s 4th Dragoons, to march, but the cavalry’s progress was interrupted when nineteen men from Craig’s troop, disgruntled at not receiving their pay, rode off toward Philadelphia to demand money. Moylan sent two troops after them, but they didn’t overtake the mutineers till “after a very severe chase of upwards of forty miles … The horses they rode, and the horses rode by their pursuers are so stiff that I cannot pretend to move them this day. I hope it will not be attended with any ill consequence as I am informed the enemy’s fleet are sailing down to the Hook.” Charged with mutiny and desertion, Craig’s men were sentenced to be executed, but Washington pardoned them, though he ordered them “to quit the Horse and enter into the foot-service,” ensuring none of them would get quite as far if they tried deserting again. The British army sailed up the Chesapeake to land at Head of Elk, threatening both Philadelphia and the prosperous Pennsylvania hinterlands, so crucial to logistical support of the American military. Washington moved south to confront them, fighting the largest battle of the war at Brandywine on September 11, then retiring. Though the exact deployment of the 4th Light Dragoons during the battle is not recorded, Charles Craig was wounded in the battle. After the British occupied Philadelphia, the American army perched on a series of ridges at Whitemarsh, fifteen miles from the city, denying their enemy easy access to the surrounding countryside, rich in food, forage and military supplies, while remaining a military threat. Washington relied on cavalry units as his eyes and ears in the no man’s land between the two armies. Cavalry on the lines performed several functions: serving as a warning system about enemy movement; controlling access and the flow of information, goods and supplies between the occupied city and the hinterland; and gathering intelligence. Any of these activities were likely to provoke skirmishes with enemy horsemen engaged in the same business. Maj. John Clark and Col. Elias Boudinot took over espionage responsibilities. They designated three trusted officers to gather intelligence: Henry Lee of Bland’s Light Dragoons; Allen McLane, who had raised and outfitted his own company of light horsemen; and Charles Craig of Moylan’s Light Dragoons. These men guarded the major roads out of Philadelphia: Lee on the Ridge Road along the Schuylkill River; McLane the Germantown and York Roads in the center; and Craig, the King’s Highway through Frankford, along the Delaware. Craig quickly proved his utility, meriting praise from Washington on November 9 by capturing fourteen of the enemy. Espionage was viewed as a dirty business, Requiring dishonesty and subterfuge through intermediaries in contact with the enemy, it could compromise an officer’s integrity. Many of those contacts might be former friends, neighbors or relatives of ambivalent allegiance, or even active Tories. Information gathering naturally involved some quid pro quo, including exchange of non-military information about the condition of family, friends and businesses. Because information flowed in both directions, intelligence officers were vulnerable to accusations of double dealing. Such may have been the case as Craig sought information about British preparations for a final attempt at dislodging, defeating and dispersing the Americans before ending the campaign season and settling into winter quarters in Philadelphia. The light horse had been supplying headquarters with a steady stream of intelligence about British plans. On the evening of December 3, Craig crossed the bridge over Frankford Creek and rode into the British lines for a talk with a pair of acquaintances: William Allen (III) and Abel James, a prominent Quaker merchant. In the eyes of Pennsylvania’s radicals, Craig’s connections to these two men seemed to compromise him. While the revolution drove a wedge between associates, friends, and even families, not all relationships severed completely. Many individuals tried to steer a neutral course but this was not always possible. Initially, William Allen (II) and his four sons warmly supported the cause of American self determination. While in London, William had been an outspoken opponent of the Stamp Act. Son Andrew was a delegate to the Second Continental Congress, John served on Philadelphia’s Committee of Inspection and Observation, while James and William both joined the Pennsylvania militia to resist the British by force of arms. The family possessed substantial iron works in Hunterdon County, northwestern New Jersey, and initially offered cannon shot to the Philadelphia Committee of Safety. Politically, the Allens gradually found themselves in an untenable position. Through public positions they held and oaths they had sworn, the family was so inextricably tied to Great Britain that they could not, with honor, support the total break with the mother country occasioned by the Declaration of Independence. Charles Craig had many points of connection with the Allen family, besides John Allen’s advocacy. In October 1775, William Allen’s youngest son, William (III), had been appointed a captain in William Thompson’s rifle battalion—as fellow company commanders, the two were intimately familiar. Later, William became lieutenant colonel of the 2nd Pennsylvania Battalion, having recruited two companies of Pennsylvania troops. The new battalion, led by Colonel Thompson, included a company captained by Charles’ brother, Thomas. The battalion served in Canada, where Allen earned praise for helping save the American army after its defeat at Trois Rivieres. During the early part of the Revolution, William’s brother James, a Pennsylvania Assemblyman, “supported resistance to Great Britain, but not revolution” like the rest of his family. Through his father, he became a large-scale landowner in Northampton. In 1776, James paid a visit to the “seat of war” in New York; an honored guest, he lodged with General Washington and his staff. Capt. Charles Craig accompanied him on his return through Jersey, after which he stopped at the family’s Hunterdon County iron works – a place where Charles would later find employ. While controlling access through the Philadelphia lines, Craig wrote a pass for the servant of James Allen’s mother-in-law, a good work which later came to haunt him. Elizabeth Drinker noted his politeness in what must have been a trying business for all involved, describing him as “eminent for his humanity without the Lines, when the British held the City”. The ominous rise of a radical populist political party in Pennsylvania, whose aim seemed to be to wrest power from the former elite, disturbed the Allens deeply. This caused them to sever their connections with the revolutionary movement late in 1776, after which they were attainted of treason by the nascent government of Pennsylvania and ever after deemed Tories. William Allen (III) resigned his commission and, as did father and brothers Andrew and John, joined the British by the end of the year, accepting an offer of amnesty. Abel James, another well-to-do Philadelphia merchant, was well known to the Allen family. Like the Allens, James owned iron works in New Jersey. In 1768, James spent several weeks working with a crew to clear the navigation of a stream near the Craigs’ home in Northampton. A Quaker, James committed to neither side in the Revolution, and was careful to antagonize neither. He and his junior business partner, Henry Drinker, supported non-importation, but, when the strictures seemed to be lifting, imported a large shipment of dutied tea. By the time the ship arrived, protests against duties on tea were again in full swing, catching the firm in a precarious position. Radical forces pressured them to destroy or return the tea. They tried to steer a neutral course, but when the rebels threatened to destroy the tea themselves, the reluctant partners agreed to send the shipment back to England, paying the freight, and causing embarrassment with their trading partners. When Philadelphia’s radicals later exiled Drinker and several other Quaker leaders to Virginia, James was able to convince them that he was no threat, and so remained in the city. These, then, were the two men Craig met before the British marched out to confront Washington at Whitemarsh. The meeting was obviously prearranged. Messengers had to have passed the lines in one direction with a proposed meeting place and time, and back again with an acceptance. Both James and Allen were then living inside the occupied city, which was surrounded by a line of fortifications. The location was convenient—James’ elegant country estate, Chalkley Hall, lay a few hundred yards from Craig’s post at the Frankford crossing, about 7 miles northeast of Philadelphia. Pickets from both sides watched the bridge over Frankford Creek. Others were also watching. An informant, probably Abraham Wilt, later sent an accusation to headquarters. Craig’s letters to Washington on December 2 and 3 contained misleading information about how the British would approach the hills above Whitemarsh. He said the enemy had already crossed to the west side of the Schuylkill in force, intending to slip around his right flank so that they could fall on the American rear. The British actually planned to march directly out the Germantown Road to confront the Americans head on. Howe’s intelligence agents planted disinformation with Craig in hopes of unbalancing and weakening Washington’s strong defensive position. Tensions ran high in the city as the British mobilized. The signs were everywhere—it was impossible to hide the fact that the army was marching somewhere—and where else but against Washington? Information and disinformation began leaking out. Some risked their lives as spies to inform the Americans, including one or two women who made their way out to the lines, ostensibly to buy flour. Elias Boudinot, coordinating American intelligence, met a woman at the Rising Sun Tavern who handed him an old needle book containing a note rolled up into the form of a pipe shank. Its contents laid out the British plan in detail, and Boudinot rode immediately to inform Washington. Another dramatic story, related many years afterward, credited Lydia Darragh with disclosing British plans to Craig at Frankford. Later writers conflated the two stories, but they may have been two separate incidents. In any event, the Americans had ample notice of the British attack. After a false start the night of December 3, the British marched out of the city late on the evening of the 4th, 10,000 strong, to confront the Americans. Next day, while the British army skirmished with the Pennsylvania militia in the Wissahickon Valley below Chestnut Hill, Craig’s dragoons filtered behind the British main body, rounding up enemy soldiers. those taken the first day by small parties of horse in Germantown, in the rear of the enemy, were for the most part drunk. These parties of ours had been posted at Frankford, and as the enemy did not extend themselves to the right of Germantown, they fell in upon the enemy’s rear, and collected stragglers with impunity. Finding the American defenses formidable during two days of skirmishing, Howe resorted to the stratagem that had served him well at Long Island and Brandywine, a secret march to turn the American flank. Pulling away from the Chestnut Hill post the night of December 6, Howe brought his main force around Washington’s left, marching up the Old York Road, their advance led by their own light dragoons. In the meantime, Washington had cautiously pulled his outposts back closer to the main army. Guarding the left were Craig’s horsemen, stationed on a spur of the Edge Hill ridge at Abington, near the intersection of the York and Susquehanna Street Roads. On the morning of the 7th, the British vanguard fell on Craig’s men, driving them from their post. Washington received a warning that morning from Dr. Enoch Edwards, who was at Abington Presbyterian Meeting, in sight of the cavalry outpost. The Enemy are moving across the Old York road about a mile below this Place … & continuing on to our Left. It appears to be a large Body. Their Horse was up here about two hours ago & I believe Capt. Craig is taken. His Men is gone off & there is no reconnoitering Party here at present. But when the dust settled, Craig had not been captured. His miraculous escape, while believable for a heroic cavalryman, may have heightened suspicions among his detractors, especially in the following week, when that mysterious letter was received at headquarters. While the main army wintered at Valley Forge, the corps of dragoons was headquartered around Trenton where it could monitor British activity at both Philadelphia and New York. Count Casimir Pulaski, in overall command of the dragoons, turned his attention toward forming his own combined-arms unit, Pulaski’s Legion, a mixed force of cavalry, infantry and artillery. Looking for a capable officer to lead his lancers, Pulaski, with Washington’s approbation, settled on Charles Craig. But this hard winter was a time of discontent among the officer ranks. Resignations abounded, some for reasons of personal hardship, many over petty jealousies or magnified disputes about seniority and promotion. In this disgruntled atmosphere, Craig submitted his own resignation to Washington. Writing from Reading on March 5, he said that his personal affairs were his principle reason for leaving the service, but went on to enumerate concerns that he had been passed over for promotion and that his honor was in question, due to rumors about his activities on the Frankford lines. In Justice to my reputation I must Likewise observe that many insinuations were thrown out at Head Quarters respecting my conduct at the Lines; which were extremely unjust & Malicious, And it gave me great Pain to find that they appeared to have some Weight with your Excellency. They were privately married, without Colonel Bird’s Consent, – I believe without soliciting it. Craig himself was, however, very sanguine … that in a short Time the Parent would be reconciled to both his Children. In this, very unhappily, all were mistaken. Colonel Bird has always remained inflexible. After the marriage, [Bird] wanted Craig to retract something he had said about him. This Craig did not think, as a man of honor, he could do. On his refusing, Bird did everything in his power to injure him. Craig declared several times to me, before I left Reading, that Bird had used him so ill he had a great mind to shoot him. About this time, Charles Biddle was asked to captain a poorly constructed ship, the Friendship, then in the Chesapeake. He persuaded Craig to serve as captain of the Friendship’s marine contingent and awaited Craig’s arrival in Baltimore. When Craig did not come, he finally appointed another former officer in his place. But just before sailing, he received shocking news: Charles Craig had shot himself. Having spent all his money, and being bred to no business, he thought if he was gone Bird would take home his wife and infant child. He therefore determined to put an end to his own existence. His friends described Craig’s melancholy state of mind. The hoped-for reconciliation with his father-in-law had not come about. His financial prospects were dim. Daniel Brodhead, Jr., living in Reading at the time, noted that Craig was less cheerful than usual and that he avoided his friends. In early July, “he was seized with a violent fever,” to which he seemed more susceptible due to his depression. His condition was so dangerous that physicians were brought from Philadelphia to save his life. Through their efforts, he appeared to be recovering but was still distraught. My Disorder is of the Mind; it is here, (placing his Hand upon his Breast) my Heart is broke… it is suspended by a Thread … I shall most Surely die … never shall I go alive down Stairs … I shall disappoint the Doctors – I know I shall. Resolved to end his life, Craig planned his final moments carefully. After taking such Precautions as were requisite to prevent Detection, he laid himself on the Bed, raising his Head, with several Pillows, to a convenient Height; he placed the Muzzle of the Pistol under one Ear, and discharged it’s Contents, which went quite thro’ his Head. The Report of the Pistol brought up his Brother Colonel Thos. Craig, who immediately burst open the Door (he having the Precaution to bolt it on the inner Side) but the unfortunate Charles was already quite dead. — I ought here to take Notice, that, least the Pistol should by any Means have proved ineffectual, he had provided his Sword, which lay across his Breast when his Brother entered the Room; so determined was he on the Perpetration of this shocking Deed. You will not leave me my Brother, my Friend, — my now, perhaps, only Friend; for have I not lost the best of Friends in the tenderest of Husbands? You must not leave me my dear Brother! Strictures against suicide were still prominent. In some parts of America, suicides were liable to confiscation of their property, leaving their families destitute, and to shameful interment, outside of consecrated ground; even, in some places, humiliation by burial at a cross roads with a stake through the heart. But attitudes had been easing throughout the eighteenth century, to the point that, at least in the mid Atlantic area, one of two possible legal interpretations could apply: felo de se (inexcusable self-homicide) or non compos mentis (essentially, a person out of his mind and unable to act rationally). Brodhead promulgated an account that would lead a coroner, who was required by law to judge the matter, to a merciful non compos mentis, decision, allowing the dead person to be buried in a churchyard and exempting his family from property confiscation. American officers conceived of a third, justifiable type of suicide, as practiced by the Romans, and epitomized in Joseph Addison’s influential drama, Cato, whose hero ends his own life by falling on his sword. The play, especially relevant at the time for its portrayal of honorable resistance to tyranny, was well known to Washington and his officer corps. It was performed at Valley Forge in May 1778. War grinds inexorably, damaging and destroying people regardless of merit. Innuendo can bring down the just as well as the unjust. Touchy on questions of personal honor and unable to let go of the ingratitude and wrongs he felt he had suffered, a nagging sense of injustice preyed upon Charles Craig. At the last, by placing his silver-mounted sword across his breast, he made a final, unanswerable statement about who he really was: a patriotic officer of the Revolution and, above all, a man of honor. Can we doubt him? Milton Rubincam, Evidence: an Exemplary Study: a Craig Family Case History(Washington, DC: National Genealogical Society: 1981). John C. Clyde, History of the Allen Township Presbyterian Church(Philadelphia: The Presbyterian Historical Society: 1876), 9-12. “William Allen,” in Lawmaking and Legislators in Pennsylvania, A Bibliographical Dictionary, Volume Three: 1757-1775, ed. Craig W. Horle, et al. (Harrisburg: House of Representatives of the Commonwealth of Pennsylvania: 2005), 231-280. The will of Allen’s father, William (I), states that he was the nephew of William Craige, of Dungannon, Ireland, a Presbyterian immigrant from Scotland. That William Craig is reputed to have been the father of Thomas Craig (I), who founded the Craig Settlement. Thus Thomas Craig (I), the settler, grandfather of Charles Craig, and William Allen (II) were most probably cousins. William Parsons to Benjamin Franklin, January 15, 1753, The Papers of Benjamin Franklin, ed. Leonard W. Larabee. et al. (New Haven: Yale University Press, 1961), 4:410-411. Reprimand: August 28, 1753: Pennsylvania Archives, Ser. 8, Vol. 4, 3575. Lawmaking and Legislators in Pennsylvania, 545. Benjamin Franklin to Robert Hunter Morris, January 14, 1756, franklinpapers.org/franklin//framedVolumes.jsp?vol=6&page=357a. The Craigs would have been seen as political allies of William Allen, whose deteriorating relationship with Franklin, dating from this period, would gradually descend into outright antagonism. Report of the Commission to Locate the Site of the Frontier Forts of Pennsylvania, Volume 1, ed. Thomas Lynch Montgomery (Harrisburg: Wm. Stanley Ray: 1916), 164-174. Oscar Jewell Harvey, A History of Wilkes-Barré, Luzerne County(Wilkes-Barré: Raeder Press, 1909), 669-671. Pennsylvania ArchivesSer. 5, Vol. 8, 531. Pennsylvania ArchivesSer. 2, Vol. 14, 595. Charles Craig to William Thompson, September 25, 1775, Library of Congress, George Washington Papers, cdn.loc.gov/master/mss/mgw/mgw4/034/0100/0197.jpg. Thomas Craig to Thompson, September 25, 1775, Library of Congress, George Washington Papers, cdn.loc.gov/master/mss/mgw/mgw4/034/0100/0199.jpg. Thompson to John Allen, November 14, 1775, Pennsylvania ArchivesSer. 1, Vol. 4, 680. By this time, the Northampton Rifle Company, which was among the very first U.S. army units authorized by Congress on June 14, 1775, had been incorporated into Thompson’s Pennsylvania Rifle Battalion. Autobiography of Charles Biddle, Vice-President of the Supreme Executive Council of Pennsylvania, 1745-1821(Philadelphia: E. Claxton and Company: 1883), 172. Nicholas Haussegger to George Washington, January 16, 1777, Founders Online, George Washington Papers (GWP), founders.archives.gov/documents/Washington/03-08-02-0087. Joseph Reed, probably repeating what he had heard from others, incorrectly stated that Haussegger was captured the day before at the crossing of the Assunpink. Many later historians perpetuate the error. Craig was appointed a captain of dragoons January 10, 1777. The unit is generally referred to today as the 4th Regiment of Continental Light Dragoons. Revolutionary War Rolls, 1775-1783, National Archives, M246, Roll 0115, www.fold3.com/image/10196456.Journals of the Continental Congress, May 13, 1777, Library of Congress, memory.loc.gov/cgi-bin/query/r?ammem/hlaw:@field(DOCID+@lit(jc007104. Stephen Moylan to George Washington, July 12, 1777, GWP, founders.archives.gov/documents/Washington/03-10-02-0254. Moylan to Washington, July 21, 1777, GWP, founders.archives.gov/documents/Washington/03-10-02-0339. Washington, General Orders, August 19, 1777, GWP, founders.archives.gov/documents/Washington/03-11-02-0001. Pennsylvania Archives, Ser. 2, Vo. 10, 337. This record is for Craig’s old regiment, by then called First Pennsylvania, though he was actually serving in the Moylan’s Light Dragoons at Brandywine. John Laurens to Henry Laurens, November 9, 1777, The Army Correspondence of Colonel John Laurens in the Years 1777-8, 73.Washington, General Orders, November 9, 1777, Founders Online, founders.archives.gov/documents/Washington/03-12-02-0169. Capturing enemy horses and arms was not without rewards – Craig received $770 for his efforts, and presumably distributed some of that to the men involved in the action. Keith W. Wright, A History of the Andover Iron Works: “Come Penny Go Pound”(Charleston: The History Press: 2013), 66. John B. B. Trussell, The Pennyslvania Line: Regimental Organization and Operations, 1776-1783(Harrisburg, Pennsylvania Historical and Museum Commission: 1977), 40, 57, 60. 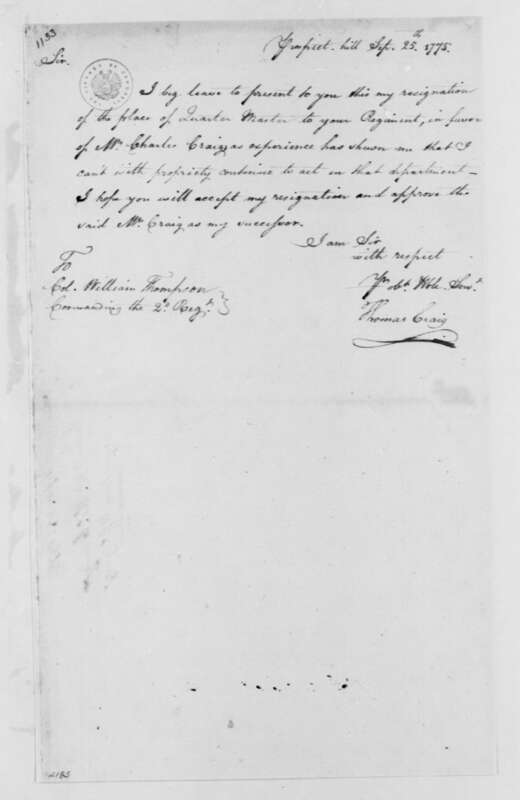 Anthony Wayne to Benjamin Franklin, June 13, 1776, Founders Online, Historical Society of Pennsylvania, founders.archives.gov/documents/Franklin/01-22-02-0279. “Diary of James Allen, Esq., of Philadelphia, Counsellor-at-Law, 1770-1778,” Pennsylvania Magazine of History and Biography9 (1885): 191-193. Anonymous Letter “Accusation of Captn. Craig,” December 11, 1777, Library of Congress, George Washington Papers, www.loc.gov/resource/mgw4.046_0208_0209/?sp=2. The Diary of Elizabeth Drinker, Volume 1: 1758-1795, ed. Elaine Forman Crane, (Boston, Northeastern University Press: 1991) 402. David Haugaard, “Abel James,” in Lawmaking and Legislators in Pennsylvania, 759. “Accusation of Captn. Craig,” December 11, 1777. Spelling and punctuation have been normalized to make the anonymous letter easier to understand. A transcription can be found: founders.archives.gov/documents/Washington/03-12-02-0483. On March 11 following, Philadelphia resident Abraham Wilt swore a deposition before Horatio Gates, President of the Board of War, then sitting at York with the Continental Congress. Wilt’s description of events was essentially the same as the letter of accusation. This undermining of one of Washington’s trusted men occurred at the time when a political faction sought to replace Washington with Gates. Charles Craig to Washington, December 2, 1777, GWP, founders.archives.gov/documents/Washington/03-12-02-0469. Charles Craig to Washington, December 3, 1777, GWP, founders.archives.gov/documents/Washington/03-12-02-0483. A Pennsylvania ironmaster wrote from Frankford on December 4, exposing the British intent to trick Washington into shifting his ground. William Dewees to Washington, December 4, 1777, GWP, founders.archives.gov/documents/Washington/03-12-02-0496. Elias Boudinot, Journal or Historical Reflections of American Events during the Revolutionary War(Philadelphia: Frederick Bourquin, 1894). It was nearly fifty years before the earliest account of Lydia Darragh was published: John Sanderson, “Biography of the Signers of the Declaration of Independence,” American Quarterly Review, Vol. 1, No. 1 (Philadelphia, Carey, Lee & Carey: 1827), 32-34. Boudinot’s recollection of events was not widely known until publication of his journal in 1894. Allen McLane had the Rising Sun post, while Craig held the Frankford crossing. Later publications further complicate matters by confusing Captain Craig with his brother, Thomas, at the time colonel of the 3rd Pennsylvania Regiment, posted on the Whitemarsh hills. Pennsylvania Packet, December 17, 1777. Enoch Edwards to Washington, December 7, 1777, GWP, founders.archives.gov/documents/Washington/03-12-02-0521. Casimir Pulaski to Washington, January 20, 1778, GWP, founders.archives.gov/documents/Washington/03-13-02-0259. Washington to Pulaski, January 26, 1778, GWP, founders.archives.gov/documents/Washington/03-13-02-0312. Charles Craig to Washington, March 5, 1778, GWP, founders.archives.gov/documents/Washington/03-14-02-0047. Although Craig formally left the service at this time, he continued to act in the American military’s interest. During the spring of 1779, he acted as a scout or liaison in the dangerous wilderness near the juncture of Pennsylvania, New Jersey and New York. John Sullivan to Washington, May 8, 1779, GWP, founders.archives.gov/documents/Washington/03-20-02-0348. 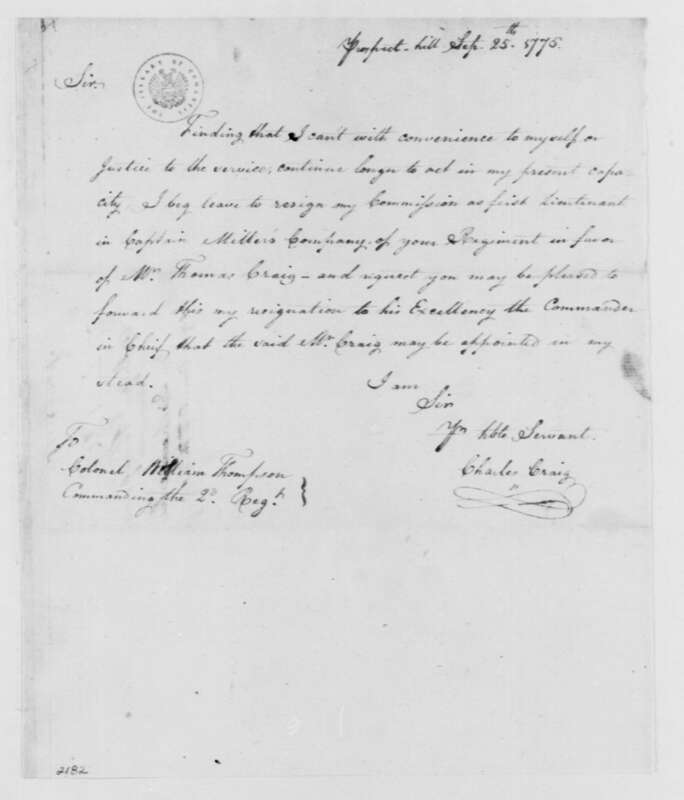 Daniel Brodhead, Jr. to Walter Jenifer Stone, July 12, 1782, Historical Society of Pennsylvania, Gratz Collection, Case 4, Box 11. Wright, A History of the Andover Iron Works73. Brodhead to Stone, July 12, 1782. Subsequent comments by Brodhead are from the same letter. Autobiography of Charles Biddle, 172. It seems unlikely that Craig actually planned to “fall on his sword,” rather that his placing the sword across his breast was a symbolic act. Bradley Chapin, “Felony Law Reform in the Early Republic,” Pennsylvania Magazine of History and Biography113, (1989): 163-183. Chapin notes: “The common law regarded suicides as felons punishable by forfeiture of chattels and ignominious burial. Inquest juries generally avoided at least the forfeiture by finding insanity … The infamy [of “shameful interment”] consisted of being buried in or near the king’s highway with a stake driven through the heart. Whether or not suicides should have a Christian burial was a vexed question in colonial jurisdictions.” Two weeks afterward, alluding to Craig’s death, Jacob Hiltzheimer noted the ignominious burial, in a potter’s field, of another suicide, Major Galvan. “Extracts from the Diary of Jacob Hiltzheimer, 1768-1798,” Pennsylvania Magazine of History & Biography16, (1892): 162. Joseph Addison, Cato, 1713, Act V, Scene 1, www.gutenberg.org/files/31592/31592-h/31592-h.htm. Administration of Charles Craig, Berks County Pennsylvania, www.familysearch.org/ark:/61903/3:1:3QSQ-G991-C7P1?i=1606&wc=9PM6-BZ4%3A268499201%2C268973901&cc=1999196. The inventory lists “1 Silver Mounted Sword” valued at £4. I am indebted to Don Waldo for many insights into Charles Craig’s service in the Light Dragoons. Thank you for this fascinating and well-researched article! In addition to the information focused on Charles Craig, it provides greater insights into the conflicted loyalties of the Allen family than I had seen before. Thanks, Randall! It has been easy, over the years, to simply dismiss the Allens as traitors to our nation. The reality was not so simple, for them or for many others. Excellent and intriguing! A great example of the complex relationships that civility fostered among many during the conflict! Al, you’re right. Things were complicated and messy for lots of people. Large-scale history tends to blur the sharp edges. Personal histories can better reveal the kind of difficult choices individuals faced.